This is the real centre for the entertainment and the night life on the Corfu island. 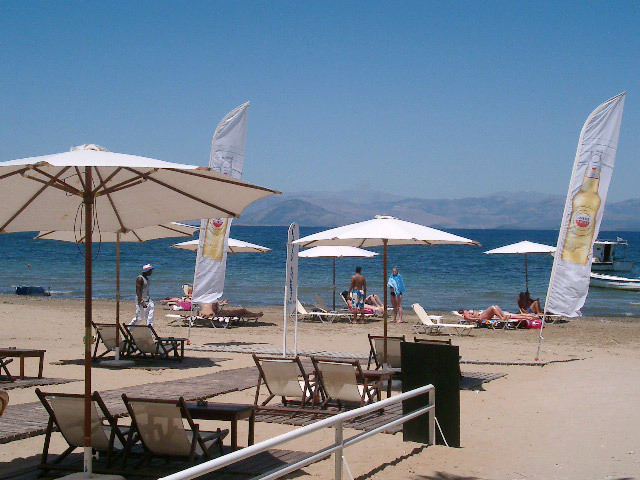 Developed first along the main road, long about 3 kilometres till the beach, Kavos is becoming today bigger and bigger. 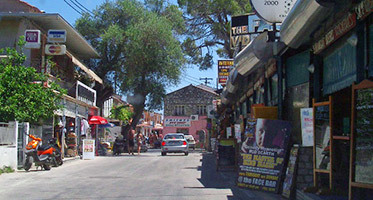 Today Kavos is the most equipped village for those who are searching daily activities and night life. Kavos village that seems a desert during winter time offers hotels, night clubs, tourist shops and supermarkets one next to the other. Most of them remain open all day long till late in the night, to satisfy any tourist needs. Remember that Kavos is not the right place where to stay if you’re looking for quiet and relax. The tourism in this village is mostly English. Kavos is the favourite place chosen by English tourism who enjoy the beach during both day and night. Kavos is the most tourist resort and beach of the entire Corfu. Its beach is sandy, well equipped for tourists and ideal also for children as here the sea is not very deep. You can find several snack bars just in front of the sea and a large choice of water sports. Kavos is connected with Corfu town by the public bus service that can take you to Corfu many times every day. Moreover there are several rental points where you can rent a jeep, a car, a motorbike or a bicycle to move around the island. In Kavos you can also choose between different organised tours to go to visit Paxi and Antipaxos islands and the Albanian coast. In Kavos you can really find any kind of shop you need: supermarkets, pastry shops, tourist shops, jeweller's shops, pharmacy and lots more. Along the principal streets you will also find several cocktail bars and local restaurants. If others villages are dead after three o’clock in the night, Kavos is full of young people all night long. You will find disco clubs on two floors and many great cocktail bars. Restaurants offer mainly English and international kitchen; however for a traditional dinner it will be better not to stay in Kavos. Kavos is a pretty big resort that offers different kind of accommodation to satisfy any need. Here you can find also a camping.